A sensitive, accurate and simple method for the simultaneous preconcentration of Cu(II), Ni(II), Cd(II), Mn(II), Cr(III) and Pb(II) in milk samples has been reported in this study. Target metal ions were determined by flame atomic absorption spectrometry (FAAS) after preconcentration on Aspergillus niger (A. niger) loaded on TiO2 nanoparticles. The dead biomass of A. niger was first loaded on TiO2 nanoparticles and bioadsorbent obtained was characterized by SEM. The effect of pH, amount of bioadsorbent, elution conditions, maximum sample volume and flow rate on the recovery of trace metal ions studied were investigated. 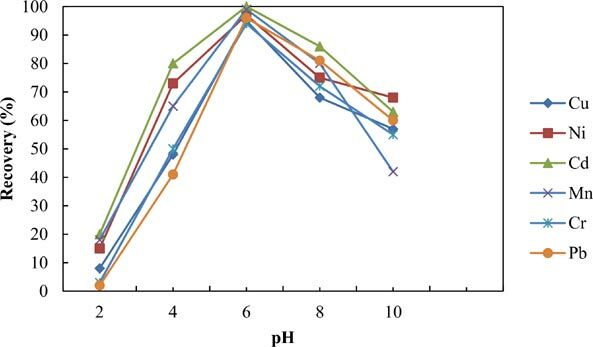 Trace metals were quantitatively sorbed on the bioadsorbent at pH 6.0, at a flow rate of 3.0 mL min-1 and subsequently eluted from the mini column with 2.0 mL of 0.5 mol L-1 HNO3. The preconcentration factor of the proposed method was 600. Detection limits (3s) of the method were 0.21 µg L-1 for Cu(II), 0.34 µg L-1 for Ni(II), 0.18 µg L-1 for Cd(II), 0.08 µg L-1 for Mn(II), 0.53 g L-1 for Cr(III) and for 0.61 µg L-1 Pb(II). Relative standard deviations (RSDs) of the method are lower than 3% indicating that the precision of method is very good. The accuracy was evaluated by means of the analysis of the standard reference material (NIST SRM 8435, whole milk powder). Finally, the developed preconcentration method was applied to the quantification of Cu(II), Ni(II), Cd(II), Mn(II), Cr(III) and Pb(II) in different milk samples by FAAS. Aspergillus niger, TiO2 nanoparticle, trace metal ions, solid phase extraction, FAAS, milk. Department of Chemistry, Faculty of Science and Arts, Yildiz Technical University, 34210 Davutpasa- Istanbul, Turkey.